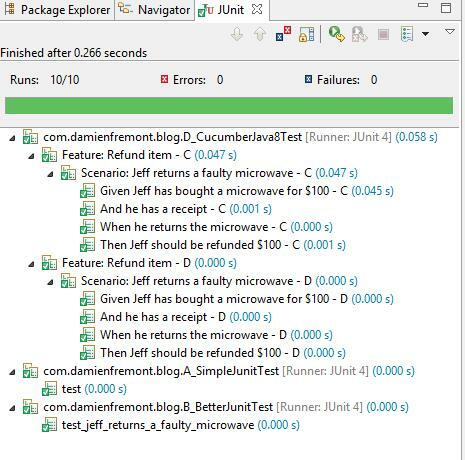 This post explains how to migrate source code from simple JUnit test to Cucumber Java Test. It’s a not so simple task, because in older JUnit test the behaviour is not always implemetend. It’s the shortest source code ever. But it lacks stability, behaviour and documentation. It’s stable and behaviour-oriented code. But functions reuse is not possible, and Javadoc is not an open collaboration format for other people like Product-Owner. It’s modular code and functions reuse is possible. But it’s not very productive because of the duplicate annotation/function syntax. This project runs the four test classes, targeting the same implementation.